NOVA Robotics is on the cutting edge of military science, and has been developing autonomous robots for use in the battlefield. On the day that the first five units are being shown off to potential customers, a lightning strike hits robot Number 5 and intelligence awakens. The disoriented robot, fascinated by the world it is newly conscious of, wanders off the premises before anyone notices, and soon NOVA is in an uproar trying to locate a nuclear robot armed with a lethal laser, unleashed on unsuspecting Oregon. Scientist Newton Crosby is fascinated by the malfunction and wishes to study the renegade robot, but chief of security Skroeder will only be satisfied with Number 5 in pieces. Meanwhile Number 5 in his search for input has encountered caterer and animal lover Stephanie Speck, who has mistaken the robot for a visitor from the stars. Short Circuit gets a 2.35:1 widescreen 1080p transfer on this disc. It looks pretty good at first glance, the image is clear and sharp, and the print has cleaned up a treat, with no sign of age or print damage. Detail levels are good, which given the amount of cutting edge nineteen-eighties technology on show is very much a positive, and there is no sign of visible compression. However, we do have DNR to an excessive level, to the point where film grain has practically been scrubbed from the film, skin tones are waxy, and dark detail is lacking, not that there is much in this bright and colourful film. One thing that the HD presentation does is make the matte paintings painfully obvious, which makes me wonder why I missed them on the DVD. You have the choice between PCM 2.0 Stereo English and DTS 5.1 Surround in the same, with English subtitles. You make your choices from the main or pop-up menus and the audio is then locked for the duration of the film. The surround certainly feels more immersive and effective, without sounding artificial or forced (this was originally a stereo presentation in cinemas), but you do have the choice of the authentic audio as well. The lossless track is quieter than the surround track though. On my Panasonic home cinema, I came up against a sound sync issue, and had to delay the audio by 50ms to get it synced up again. One advantage this disc has over the DVD is that this time we get most of the extras that were left out of the UK release last time. You get one disc in a BD Amaray, which boots to an animated menu. The audio commentary with director John Badham and writers Steve Wilson and Brent Maddock is well worth listening to, very informative. You get interviews with Ally Sheedy (2:17), Steve Guttenberg (2:23), and John Badham (2:06). There is a Behind the Scenes featurette (6:46), and a Creation of No. 5 featurette (6:46). Familiar to owners of the DVD will be the Syd Mead Interview (17:34), Eric Allard Interview (35:01), and the Trailer (1:50). I’m going to have to be wary of releases from Second Sight now. Thunderbolt and Lightfoot and Space Truckers both turned out fine, but first Midnight Run, and now Short Circuit have both suffered from DNR, and they’ve both delivered out of sync audio on my home cinema. I wound up importing a German release of Midnight Run to remedy that, but when it comes to Short Circuit, while I do like the film, I don’t like it that much. This Blu-ray with all its problems is still good enough for me. Short Circuit is still an enjoyable film, with plenty of good clean family fun, comedy and quirky characters to thoroughly entertain over its runtime. Yet it doesn’t quite hit all the right notes to ensure its place in the pantheon of eighties classics. The cast by and large is good, Ally Sheedy is great as Stephanie, the kind-hearted caterer who encounters Number 5 and educates him about the wider world. Steve Guttenberg is pretty nondescript as Newton Crosby, and I just can’t accept him as a top military robotic scientist. It doesn’t help when nearly every scene is stolen by Fisher Stevens, browned up as fellow scientist Ben Jabituya and sporting the thickest Indian accent this side of Mind Your Language. It’s pretty believable too, and I had no problems with his casting. I can also appreciate his chat up technique. “I enjoyed repeatedly throwing you to the ground, Namaste” Actually the two of them do have a brief routine about socially inept scientists finally unleashed on an unsuspecting world, but unfortunately that isn’t taken far enough to develop their characters. Guttenberg’s fellow Police Academy alumnus G.W. Bailey basically reprises his Lieutenant Harris character as NOVA’s chief of security, Skroeder. 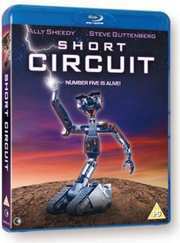 It’s interesting to hear that Short Circuit was initially envisaged as a serious film, a tale of machines turning against their masters, but as Terminator had already effectively covered that story, this comedy was the result. The problem with Short Circuit is that director John Badham had also already covered this ground to far better effect in the earlier Wargames, another tale of machine intelligence gone out of control. Short Circuit is pretty much the same tale, without the threat of nuclear Armageddon and with plenty of slapstick instead. Once again the evil military monolith is relentlessly plunging ahead with automating warfare, but this time it doesn’t take a couple of teenagers to teach them a lesson, this time it’s the machine who develops a conscience. The message gets diluted in a barrage of slapstick humour and hilarity and Short Circuit is definitely aimed at the lower age bracket of the audience. I’m sure your inner child will appreciate the anthropomorphic cuteness of Number 5, and adults will get the Three Stooges homage and the John Wayne impersonation. It’s just that after the robot with a soul moment has passed, the story begins to feel a little thin, and I was left wondering how much more Short Circuit could have been. 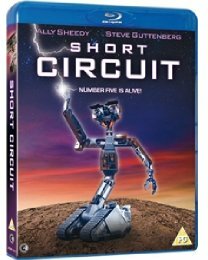 I do appreciate Short Circuit more now than when I reviewed the DVD though. It wears its age well, and has a charm and innocence that modern cinema would only treat with irony and knowing winks. I hear rumours of a Short Circuit remake, and can only hope that they are indeed nothing more than rumours.